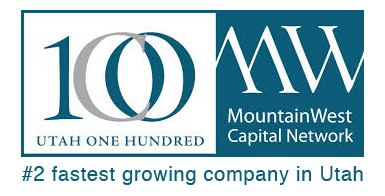 Governor Herbert lauded the top 100 companies chosen at the MountainWest Capital Network (MWCN) Utah 100 event Tuesday. “Utah. It’s still the right place for business,” Herbert said. Utah County was well represented, with more than 30 companies ranking in the Utah Top 100 fastest growing businesses, three in the top 15 of Revenue Growth Companies, and 10 of the top 16 Emerging Elite businesses. The Utah Top 100 were ranked according to percentage of revenue increase of each company from 2010 to 2014. Boostability in Lehi was ranked No. 2, second only to Draper’ Crest Financial. Three other Utah County companies placed in the top 10 — in sixth, seventh and eighth place respectively, Peak Capital Partners of Provo; eLearning Brothers of American Fork; and Simplicity Laser of Lindon. “We had a record number of companies vying for the 100 fastest growing companies in Utah this year — a true indicator of the business and economic success occurring in Utah. We recognize each company of the Utah 100 and congratulate them on their growth and success,” said Paul Skeen, chairman of the MWCN Utah 100 committee. Of the many technology, financial and health industry businesses featured Tuesday, of note were the few outliers. Only a few of the recognized companies were from the food industry, and only one was an ice cream shop. In their first time out, American Fork’s Sub Zero Ice Cream landed fairly high in the rankings at No. 35. The business has been around for almost a decade, and its growth has definitely not been of the unicorn variety often seen along Silicon Slopes. Still, what started as an idea by husband and wife team Jerry and Naomi Hancock, to instantly freeze fresh cream to make custom ice cream concoctions for customers, has spread to 47 franchise locations across the United States, with one in Wuhan, China and one in Abu Dhabi. To earn a spot in the top 15 of Revenue Growth Companies, businesses had to not necessarily grow in size or reach, but in revenue growth in 2014. The three Utah County companies that made that list were Nu Skin Enterprises in the No. 2 spot, Vivint in the No. 7 spot, and Ancestry.com in the No. 8 spot. In keeping with recent successes lauded throughout the state and abroad, Utah County businesses swept the Emerging Elite category. The Emerging Elite were selected from among companies with less than five, but more than two years of operation, showing significant promise for future success. The following Utah County companies were within that exclusive group: Alterra, Omadi and Podium in Provo; Jane.com, Nuvi and Younique in Lehi; Q Sciences, Rags to Raches and SkyRocket Media out of Pleasant Grove; and Snap Power in Vineyard.